Earth Day 2010 Campaign Director Nate Byer speaking at the Global Day of Service event at the National Mall, Washington, D.C.
April 22nd is the 40th anniversary of Earth Day, an occasion for people to celebrate and raise awareness of the natural world. Today with news of melting glaciers, increasingly severe droughts, floods, and storms and rising ocean levels, Earth Day celebrants around the world are marking the anniversary with new calls to combat global warming and to protect our threatened environment. In the years leading up to that first Earth Day in 1970, many Americans felt growing concerns about unchecked air and water pollution and the destruction of forests and other important ecosystems around the planet. Twenty-five-year-old Harvard law student and first Earth Day national coordinator Denis Hayes says obvious signs pointed to the sad state of the environment. "In Los Angeles, for simply breathing, it was the equivalent of smoking two packs of cigarettes a day. We had rivers that were catching on fire, lakes that were dying. The national emblem the American eagle was on the verge of extinction." 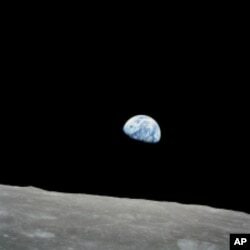 View of Earth as photographed by the Apollo 8 astronauts on their return trip from the moon in December 1968. Many historians say Earth Day might have been inspired, too, by a single, historic photograph. It was the image of a fragile-looking Earth set against the blackness of space, taken by Apollo astronauts circling the moon for the first time in 1968. But the surge in environmental activism also drew from the growing movement against the U.S. war in Vietnam in the late 1960s. Hayes says support for Earth Day spread quickly and on April 22nd, one in every 10 Americans took part in the nationwide observance - attending rallies, musical concerts, planting trees or cleaning up local streams and parks. "It was to raise a set of issues, to tie them all together into one fabric so that the people who were fighting against pesticides and the people who were fighting to stop freeways cutting through their neighborhoods or fighting against air pollution or fighting to preserve a wetland would realize that they had common values and that they ought to be working together instead of as separate organizations." The public outcry on that first Earth Day led to political action. The U.S. Congress passed new laws to protect the air, water and endangered species, and created the U.S. Environmental Protection Agency, or E.P.A. Forty years later, the annual observance has become a global event. An estimated one billion people in 191 countries take part in a multitude of events, coordinated by the nonprofit U.S.-based group, Earth Day Network. The National Mall gets spruced up thanks to volunteers who rake, hoe, mulch and pick up debris. The epicenter of Earth Day 2010 activities in the United States is Washington, DC. And it's here on the green expanse of the National Mall at the foot of the United States Capitol that the nine-day event kicked off last weekend with a simple service project. Volunteers came to help the U.S. Park Service clean up the nation's front yard. Armed with hoes and rakes they mulched and weeded and picked up debris. Nearby is a kind of eco-village, with exhibit tents and globes that artists have sculpted and painted. A wide range of nonprofit environmental groups are on hand, as are foreign embassies, corporations and federal agencies, from the E.P.A. to NASA, the U.S. Space Agency. Much of NASA's work these days is directed at space-based Earth monitoring. Under the NASA tent, kids crowd put together jigsaw puzzles based on satellite images of the Earth. NASA scientist Ruth Netting says the activity is one way to engage children to care about the planet. "Every little bit helps so I hope that we keep working at taking care of what we have." Engaging the public this way can lead to substantive change, says Nate Byer, the Earth Day Network's 2010 Campaign Director. He says, while the Internet has helped to build a more cohesive community in the digital age, the environmental passions that launched Earth Day 1970 still resonate. He says people from of all walks of life have come to urge Congress to take action on one of the most critical environmental issues of our time: climate change. "They want a climate bill because a climate bill is a jobs bill, because it is a national security bill and it ensures that our children and our children's children will have an environment in which they can thrive." 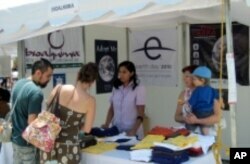 Locals in Guadalajara, Mexico learn about the history of Earth Day at the Earth Day Network/Bioalkimia booth during Dia De La Tierra 2010, organized by Bioalkimia and sponsored by Earth Day Network. Earth Day 2010 Chair Denis Hayes agrees. He adds that, unlike Earth Day 1970 which focused on local and national fixes to environmental problems, the response today must be global. "We need to now move to a new style of governance that relates to planetary affairs. We don't seem thus far to do that for pollution and we really have to because in the event of something like climate change it is not an issue that any one country can solve acting by itself." Earth Day events in Washington continue through the week culminating with Sunday's Climate Rally, featuring music by top-name artists and speeches by leading environmental activists. 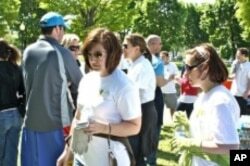 Earth Day Network is coordinating similar events across the United States and around the globe. Organizers hope Earth Day continues to serves as a rallying point for people who care about the environment, and who want to turn that care into positive action.